Mark Wahlberg (Contraband) re-teams with director Peter Berg (Lone Survivor) in the action drama Deepwater Horizon. Mark Wahlberg leads a cast that includes Kurt Russell (The Thing), John Malkovich (Red), Gina Rodriguez (TV’s Jane the Virgin) and Kate Hudson (The Skeleton Key) in the story of real-life heroes. 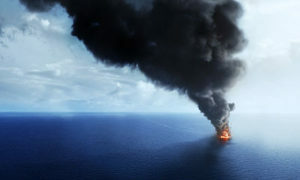 For the one hundred and twenty-six people aboard the Deepwater Horizon offshore oil rig, April 20, 2010, began like any normal day. Before day’s end, the world would bear witness to one of the greatest man-made disasters in U.S. history. Deepwater Horizon reveals the brave acts of the men and women who rose to the challenge—and risked everything to lead others to safety.